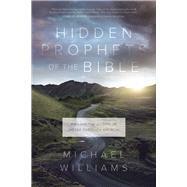 From an expert on Bible translation and interpretation comes a revealing look at the Minor Prophets. Michael Williams, PhD, takes readers on a journey from Hosea to Malachi, uncovering significant messages about Jesus and the gospel. Michael Williams, PhD, is the Johanna K. and Martin J. Wyngaarden Senior Professor in Old Testament Studies at Calvin Theological Seminary and a member of the NIV Committee on Bible Translation. He’s the author of several books, including How to Read the Bible through the Jesus Lens and The Prophet and His Message.